Although pasta salads are typically a summer bbq food, my family enjoys pasta salads all year long. My favorite thing is how diverse pasta salads can be. In my house, if I have ingredients that I want to use up, I toss them all together with a little cooked pasta. To learn how to make pasta salad, use the guide below to find a perfect flavor profile to match your pasta ingredients. Learning how to make pasta salads is very simple, and only takes a couple minutes. An Oil (2 parts): Olive oil is my favorite, but if you want a creamier salad, you can opt for mayo, sour cream or yogurt. A Vinegar (1 part): Red wine, white wine, apple cider, rice wine and balsamic vinegar are all great choices. Fresh herbs: Basil, thyme, mint, oregano, parsley, dill and cilantro are great choices. Alliums: Garlic, shallots, scallions and onions. Citrus: Fresh squeezed lemon, lime or orange juice. Other: Dijon mustard, sriracha, and sesame seeds. Once you have your oil, vinegar and seasonings, mix them together and pour your homemade dressing over your pasta salad. I usually do a ratio of 1/4 cup of dressing for 2 cups of salad, but recommend that you start with a little, and increase the amount of dressing as necessary. You can always add more, but it’s hard to take too much back! Although you can put practically anything into a pasta salad, here are a few classic additions. Pasta: Cavatappi, corkscrew, shells, bowtie and rotini are a few of my favs. You can check out this pasta shapes dictionary to see how many different options there are! Veggies: Bell peppers, olives, tomatoes, asparagus, broccoli, cucumbers and peas. Meat: Pepperoni, ham, bacon, and chicken. Cheese: Mozzarella, feta, cheddar and ricotta. 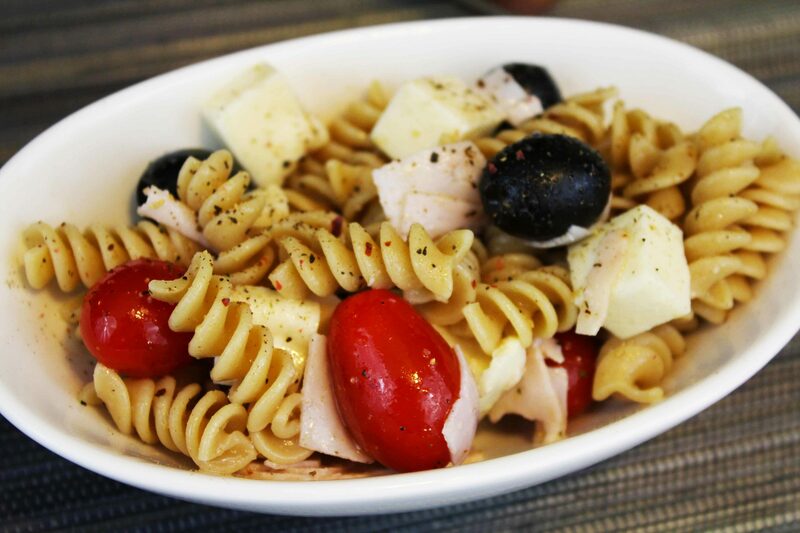 What are your favorite recipes for homemade pasta salad? Share your recipes in the comments! I made this tonight…trying to find the perfect pasta salad for a shower, but it was so vinegary. Then I realized that the amounts in the recipe are backwards, and it’s either supposed to be 1/4 c of oil to 1/8 c vinegar, or 1/4 cup vinegar to 1/2 c oil, right? Oh, you’re right! I am not sure how I missed that. I hope it didn’t ruin your pasta salad 🙁 I have modified the recipe above so the proportions are accurate. Thanks for bringing this to my attention. I hope you were able to salvage the pasta! Made this and my family gobbled it up yummy thank you for the great recipe. Yay, I am so glad to hear you liked it!! I could dig into that pasta salad right now! I love the salty combination of olives and mozzarella cheese! 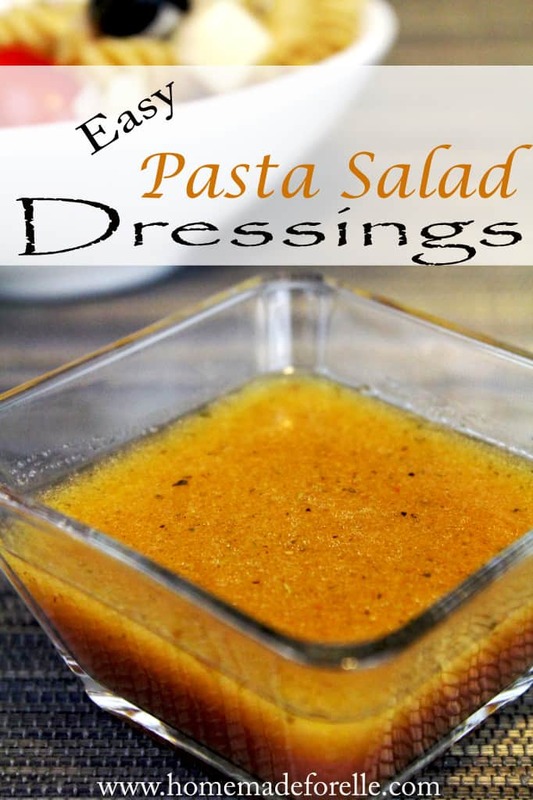 Great ideas for making a salad dressing too – I love the list of options. So glad you posted this. My family rarely made pasta salad and so I am always at a loss for making a great one from scratch. Thanks for sharing your tips and tricks! Mmm, I love pasta salad! Thanks for all the variation ideas, I’ll be trying them! These are great ideas! I’m going to pass them along to my sister, she loves pasta salads!